Paddle House é um 3.000 metros quadrados casa de férias de luxo dentro do desenvolvimento selvagem Rock on the New River Gorge. Paddle Casa oferece às famílias e amigos a opção de hospedagem mais alto-end disponíveis na região de New River Gorge. O aluguer de férias oferece vistas deslumbrantes sobre o New River Gorge, incluindo a famosa fotografada New River Gorge Bridge e do rio lá embaixo. Os hóspedes poderão desfrutar de acomodações de primeira classe em um quatro quartos, quatro banho, aluguer de férias pet-friendly. O design aberto de cozinha, sala de jantar e sala grande é um espaço perfeito para reuniões, encontros corporativos, ou eventos especiais. A espaçosa sala de refeições acomoda até 14 pessoas. Os dois decks ao ar livre oferecem vistas deslumbrantes sobre as montanhas em todo o New River Gorge, uma banheira de hidromassagem relaxante ou um lugar aconchegante para relaxar na floresta. O Paddle House está localizado a cerca de 5 minutos a pé de aventuras na Gorge, o empreendedor premier aventura em West Virginia. Há um banheiro ao lado da sala com beliches. Ele tem um vaso sanitário e pia. Pátio porta para fora com lareira na borda com vista para o New River Gorge Bridge. Fantastic house and location but lacking in upkeep. Three families traveled to the Paddle House go enjoy a holiday reunion. While the house was large, with a well stocked kitchen and great views, we did experience a few maintenance and housekeeping issues. The house was dusty and looked as if it hadn’t been vacuumed or swept in awhile. There were no extra garbage bags or toilet paper and we had to call the main office twice in order to receive additional items. The biggest issue however was the lack of hot water in the downstairs bathroom. There was none! We called the main office again and they said they would send someone from maintenance to look at the hot water heater. If someone was sent, we were never told, and the issue was never fixed. Overall, for the amount of money we spent, I expected at least a clean house with basic supplies and hot water. We would consider staying there again if these issues were addressed because it really is a beautiful home in a great area of West Virginia. Perfect spot for our gang! Great trail right out front and loved the fire pit. Everything was comfortable and clean. Thank you! I had never rented a cabin or house and this was my first experience. It was a piece of cake and I at moments thought that I was doing something wrong because it was so simple but it worked out amazing. The house is awesome and the views are magnificent. I was blown away by the house when I first walked in. The pictures honestly do not do it justice. The rooms are big and cozy, the living room is ample for any get together, the sound system around the house was clear and quite reaching. The hot tub really allowed us to relax. The house is far enough to feel like you are actually out in the wilderness but close enough to any comforts to not be worried of anything being out of your reach from restaurants to stores. We rented this cabin to go skiing in Winterplace and although it is about an hours drive away, we would do it and plan on coming back next winter. I would easily recommend this property to anyone who wants to get away for a bit. Hopefully I will be back next year! The New River Gorge is a magical place, winter, spring, summer or fall. We appreciate your business and look forward to your return. This house is simply amazing. There is nothing that even compares in the area. You are surrounded by almost a mile of wilderness in every direction and the property is lined with well kept trails to hike/bike on. The fire pit overlooking the gorge is a gem and any night outdoors I could think of few other places I'd want to be. No expense was overlooked on the interior of the house with top-end material in every room. Whether it is the ceiling-enclosed bose speakers (indoor & outdoor), multiple-head showers, or beautifully decorated rooms, this house will not disappoint. You are only a 3 minute drive to the bridge from leaving the driveway. I can't wait to come back again. From the moment we walked into the Paddle House we were captivated by the beauty of the house, as well as the surrounding woods and trails. The house surpassed our expectations. Throughout the weekend people commented on the "perfectness" of this house for our group. The kitchen worked well with the challenge of many hands wanting to "stir the pot". There was more than enough room to accommodate "too many cooks in the kitchen". Bedrooms were lovely and nicely placed for privacy. The openness, but not too large, of the living area provided a warm and cozy place to gather. We also loved walking out of the door and onto a variety of well managed trails. Best surprise....... well I guess you will just have to stay at the Paddle House and discover it for yourself. The house is roomy, well designed and uses top of the line material. The location, on the rim of the New River Gorge, is secluded, perfect for an intimate gatherings. The Paddle House is just a 5 minute walk to one of the world class outfitters, Adventures On The Gorge for those looking for adventure activities, entertainment or a delicious dinner. Our group enjoyed sitting around the fire ring and watching the moon rise above the New River and the New River Gorge Bridge. 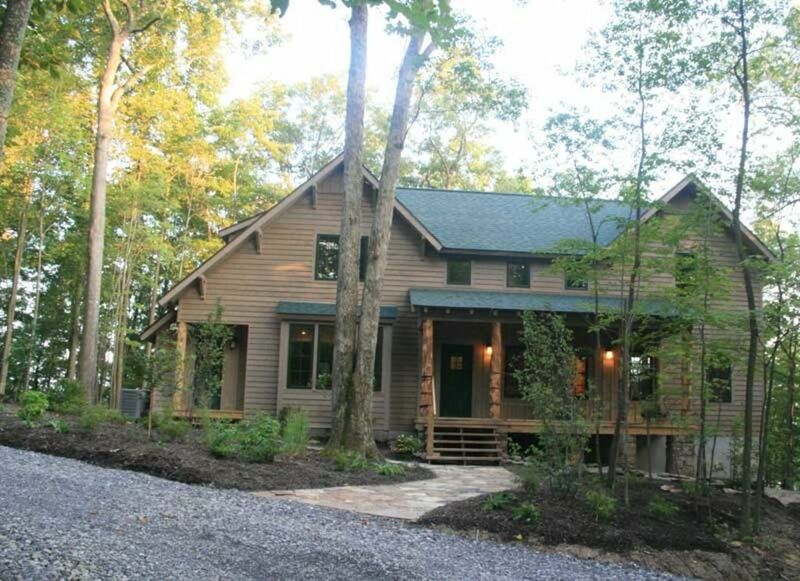 This is the best choice for a high end get away in the Fayette County area.